Ergonomic design for greater comfort and less fatigue. Polycarbonate pendant enclosure is double insulated, chemically resistant and rated NEMA 1, 2, 4, 4x and 12. Elastic, chemically resistant gasket ensures a tight seal between enclosure front and back. 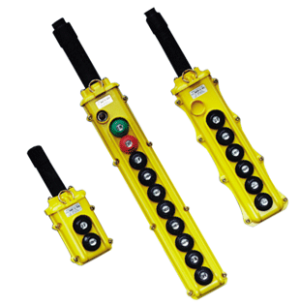 Switches are rated for 3 Amps, 250 Volts AC. 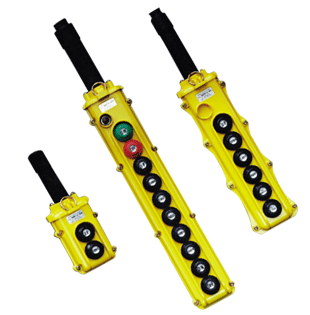 Single and two-speed button pairs have mechanical interlocks for greater safety. Suitable for temperatures ranging from -10°F to 150°F. Tapered round cable entry gland can be cut to the proper cable diameter and a slide-on rubber boot ensures a watertight seal. Strain relief hardware and plastic cable grip relieves tension on individual cable conductors. On 6 through 12 button models, a shrouded knock-out hole is provided for the installation of a pilot light or horn accessory. To simplify wiring, a common circuit is pre-wired on all switches. A wide variety of specialty and accessory switches are available. Standard units ship from stock. Factory pre-wired pendants ship with minimal lead time.